I’m not asked to pattern test that often, but I have happily done so for a couple of my indie designer buddies. 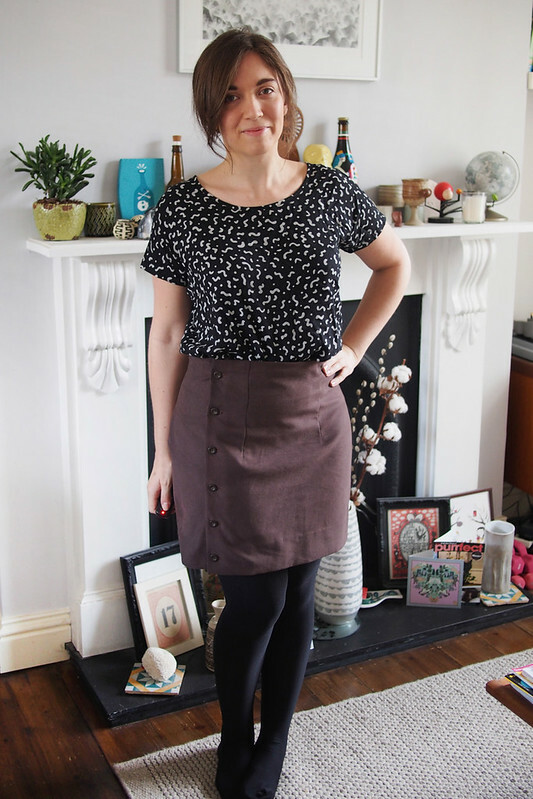 Two recent patterns which I tested have just been released – the True Bias Southport dress and the Tilly Arielle skirt – so I thought I’d share my takes on the results. I find pattern testing a really interesting process, which is why I’m happy to give my time to do it. 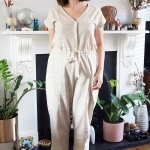 Firstly it often lets me try out patterns that I wouldn’t necessarily choose or buy for myself, and secondly I’m quite interested in the whole process of pattern development and how best to optimise instructions for maximum usability. I love submitting my feedback and seeing it applied to the final product. First up Tilly’s Arielle skirt, which comes in mini or knee lengths and offers a wiggle fit with lovely offset buttons – no zip, hoorah! 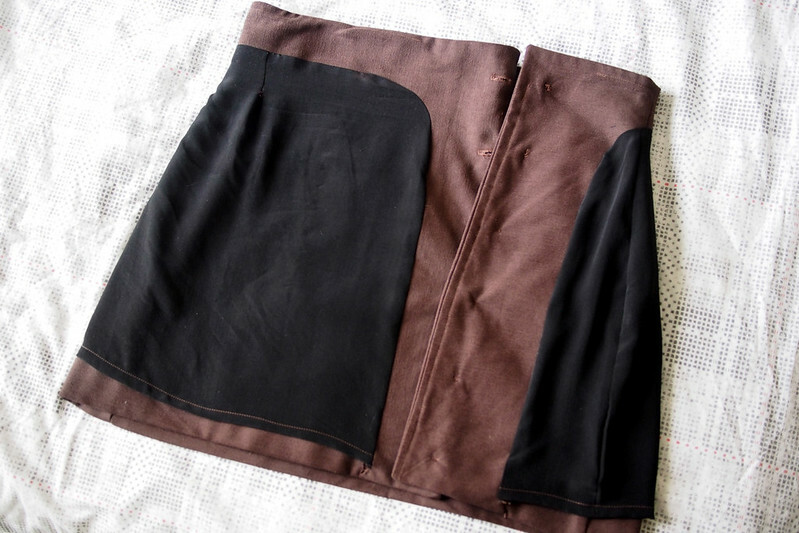 I used a brown twill for my skirt and it’s lined in black silk. Slight changes were made to the hip ease due to the testing feedback, but I actually graded up at the hip anyway because I’m between sizes – it’s an easy one to blend sizes and get a good fit. 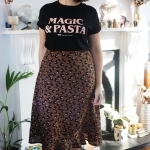 Pencil skirts aren’t a typical choice for me, but I’m pretty fond of this and it’s so easy to wear with tights and a little tee and feel a bit dressed up. 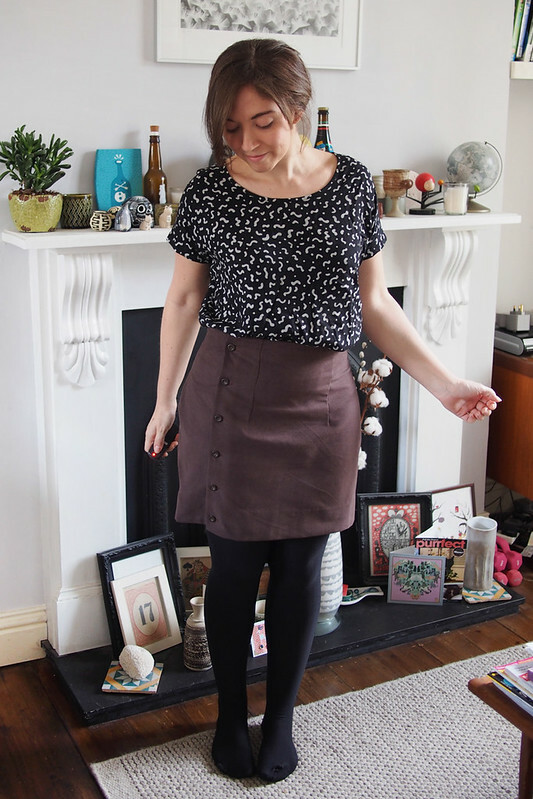 I really enjoyed testing this because it was quite a challenging sew for me – I think it’s the first faced-and-lined skirt I’ve ever put together so I really relished trying a new skill. For an easier sew the lining is totally optional and wouldn’t really be necessary in many fabrics. 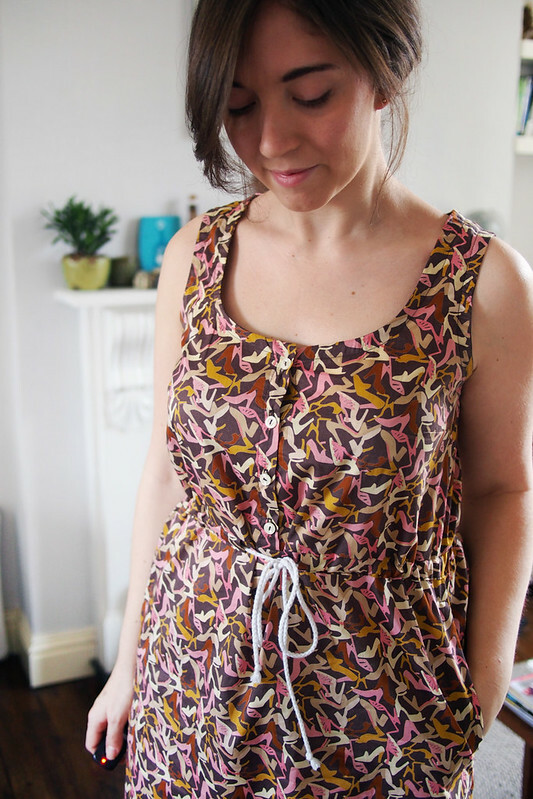 Next up – I’m a big fan of Kelli of True Bias’s pattern line, so was really pleased to be asked to test her latest. The Southport is a casual summer tank dress with a half-buttoned front (YASSS, sew all the buttons) and drawstring waist. It’s got above-knee and maxi length options and is recommended for any breezy, drapey fabric. 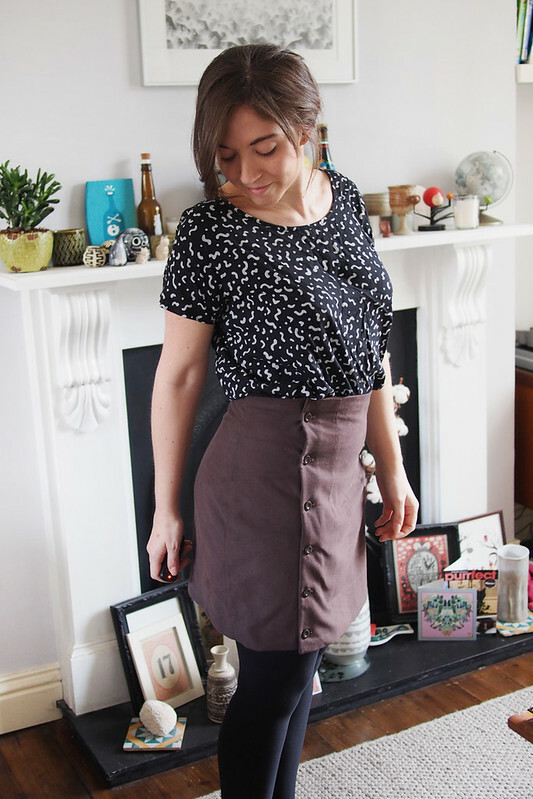 I used a fairly nutty archive Liberty print called Clara – Roisin has used it in another colourway and I scooped this 1.3m piece on eBay for pretty cheap. Welp, this dress is pretty adorable, right? I love the overall shape and style. Tank dresses are super hard to fit on my body due to my narrow shoulders and hollow chest, but this is pretty darn close. I graded from 4 at the top to 8 at the hips, and Kelli has altered the armsyce/bodice fit a bit based on feedback (so don’t use this as a final fit guide). If we get more of a sniff of summer weather or I book a nice warm holiday I’ll definitely be making a couple more of these. You can get hold of Arielle here and Southport here. Obvious disclaimer than I sewed up test versions so my review doesn’t apply to the finished fit or instructions, and I got the patterns for free in exchange for testing. Will you be adding either to your S/S sew plans? So cute! I’m loving the pattern for the dress! Love the dress! Can’t wait to try this pattern. The dress is totally lovely, I think the skirt is good too but obviously it is more dressy. I just hope we get a bit of real summer so I can rock the dress a lot! 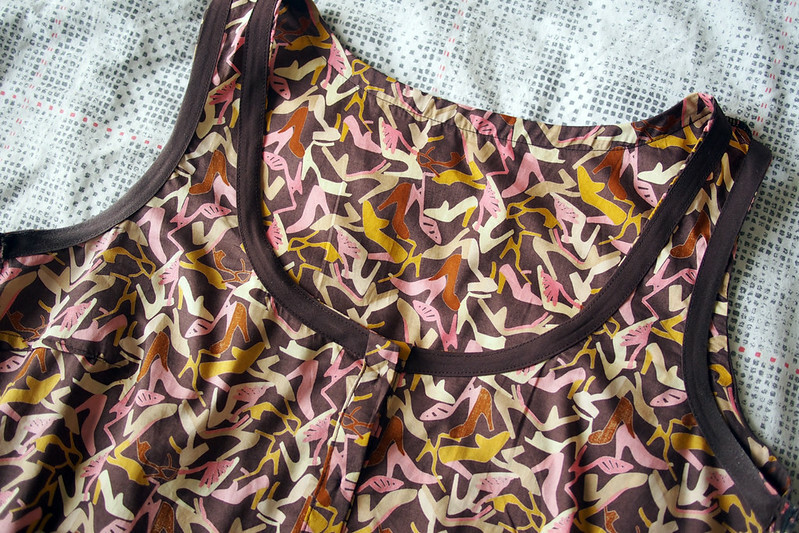 I really like your fabric choice for the Arielle, it’s such a beautiful vivid colour (at least in the photos!). 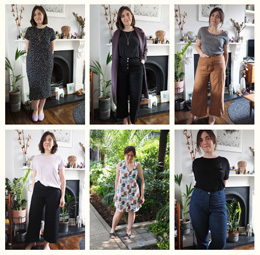 I’m still not sure whether I’ll spring for Arielle or not, as pencil skirts aren’t really my thing, but I’m enjoying seeing everyone else’s versions appear in blog land! It’s a nice rich chocolate. I don’t do pencil skirts either but I think the buttons help this one feel a bit more casual. That dress is super cute! Love the fabric you chose. Love the Southport dress! Were you really able to make it out of 1.3 meters of fabric? I have a little less than 2 yards of Cotton + Steele double gauze that I think would be awesome for this dress, but I wasn’t sure if I’d have enough fabric. Yup, with a lot of squishing and I didn’t have enough for the self-drawstring. Just under 2 yards should be plenty though! I NEEDED the Southport pattern the moment I saw it & now I want to make it even more. It may have to jump to the top op the queue. Both of these are great, but I am especially in love with the Southport dress. It suits you perfectly and the fabric you chose is really lovely. Plus I love the shoes you chose to wear with it too! Two lovely makes. I too especially like the Southport dress. What a great little dress for summer! OOoh that fabric on the Southport dress is fab. Your dress looks great. These are both really lovely, but the dress is particularly so! I adore that print and the style looks so lovely on you! I can’t wait to sew up the Southport! I like the Arielle, too, but I’ve found that for some reason I just don’t wear skirts! It’s weird, whenever I wear one I wonder why i don’t wear them more! Shame as they’re quick and fun to sew. Absolutely love the dress – it looks great on you. Hadn’t seen it was released so thanks! Both great makes! I really like how the lining is shaped into the skirt–it’s really a professional looking finish on the inside, and the dress is just fun. Love the southport dress and it fits in with your dressing style nicely, but it’s great to see you in a skirt too. The Arielle really suits you! I haven’t seen that Southport dress before, I like it!